The last week has seen Edale MRT pass the milestone of 50 callouts in 2013. Their 50th job, on Saturday 8th June, was a request from a local farmer to free a sheep which was stuck on the crags at Burbage South. A couple of team members managed to release the sheep which had become wedged in a crack. A DofE Award Scheme participant suffered a serious spinal injury after falling dopwn the steep sided Blackden Brook. After a relatively quiet weekend (apart from the sheep! ), on Monday evening they were called to two incidents simultaneously. A fell runner had injured his ankle while running near Burbage Bridge. The injured man was actually training to take part in the Nine Edges event in September which is held to raise money for the team! While team members were treating the runner and evacuating him to the road, they were called to assist a lady who had experienced a recurrence of a back problem while walking near Wheelstones on Derwent Edge. EMRT called on the help of their neighbours from Glossop MRT to assist with carrying the lady down to the road, an evacuation which took just over two hours. On Saturday 15th June, we were called to climber on Stanage Edge who had suffered a medical collapse. 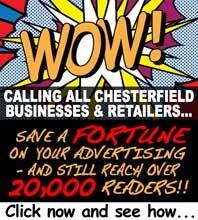 The Derbyshire, Leicestershire and Rutland Air Ambulance also attended. The serious nature of the climbers condition meant that he was anaesthetised at the scene by the helicopter crew and a team doctor, before being flown to the Northern General Hospital in Sheffield. 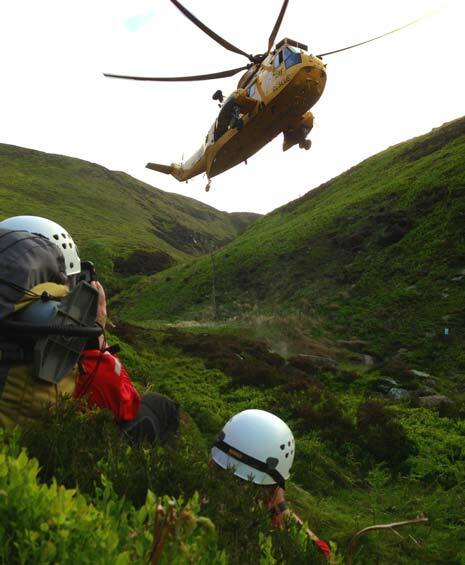 The team were assisted by some members of Scarborough MRT who were climbing nearby. The week was rounded off with a dramatic rescue on the northern edge of Kinder Scout on Sunday evening. An 18 year old on a Duke of Edinburgh's Award expedition had fallen down the steep sided Blackden Brook, injuring her back and coming to rest in a stream. One of her companions made their way down the hill to get a mobile phone signal and call for help. Glossop MRT were despatched and requested assistance from Edale team when the nature of the incident became clear. 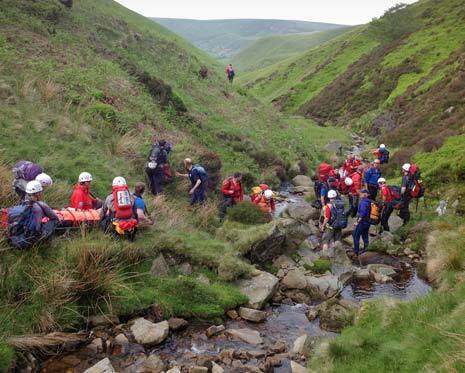 The young lady had sustained a serious spinal injury during the fall and was treated on scene by a Paramedic and Doctor from Edale MRT. The remote location and the serious nature of her injuries meant that an RAF Sea King helicopter was called in to winch her directly from the scene (above) and fly her to hospital in Sheffield.